My very favorite quote is by Aristotle and goes like this “We are what we reputedly do. Excellence therefore, is not an act but a habit.” I have it written everywhere! We can only become experts when we have done something repeatedly over a period of time. It has been said that you require 10,000 hours to become an expert. Think of the number of hours Tiger Woods, Michael Jordan and Michael Phelps practiced their various sports. It is simply not enough to have a sudden burst of energy, go out and buy some of the best golf clubs and think you would play at PGA level. And if you practice once a week, you will still not have the expertise required. You need a high practice density to make any impact. 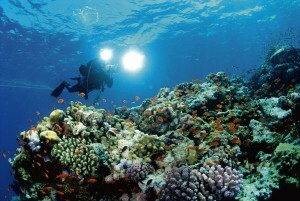 Let me give you an example: a few years ago, I lived in the Middle East and decided to explore the Red Sea with its wonderful marine life as documented by Jacques Cousteau, so I joined a scuba diving training program. Initially, I was not drawn to diving during the training, but on the last dive, it all fell in place! I enjoyed it so much, I was diving during most of my spare time: at least twice every 3 weeks, and in all kinds of situations – we did night dives, shipwreck dives, shallow and deep dives, reef and roadside dives. I came across just about everything there was to see, including sharks, and spent holidays diving in various locations including the Great Barrier Reef and Key Largo (John Pennekamp Marine Park). On the Key Largo dive, I realized that my fellow divers were very occasional divers: diving maybe once a year on their annual holiday. Because I was the most experienced, I ended up being the dive leader. I remember being somewhat uncomfortable as most of the divers were quite rusty, particularly with the safety practices, very important when you dive. I certainly would not have wanted any of these holiday divers to be the dive leader. Because we shared the Marine reserve with boats, we had to be very careful of the propellers and we needed to descend and ascend the dive in a structured manner. As we were coming up at the end of the dive, one person separated from their buddy (dive partner) and got to the surface faster and in a slightly different location than the rest of us. He was just inches away from a motor boat whizzing past! As was standard dive practice we had a marker buoy where we went diving. He came close to being chopped up because of his lack of practice and not following basic dive safety procedure! It is imperative to practice whatever you want to master; to keep on doing it repeatedly until it becomes natural, and you are so good, you can do it in your sleep! You have now become successful: an expert. You will then be able to command “expert” fees. Because they have done it so often and are good at it, experts like what they do. The same principles apply in business. You want to become an expert. That means acquiring the necessary expertise in the shortest possible time. I am here to help you on your journey to business success – subscribe to my blog & becoming engaged by leaving comments. Click HERE to turbo charge your online business success! I do consider all the ideas you have introduced for your post. They’re very convincing and will certainly work. Nonetheless, the posts are too brief for newbies. Could you please prolong them a bit from subsequent time? Thank you for the post….